In baptism the old self-centered life is set aside, and a new life of trust in God begins. Baptism is a declaration of salvation. It is a public testimony that we have accepted Jesus and are turning our back on the old life of sin and are now trusting Jesus to live a new life as a Christian (“Therefore if anyone be in Christ, they are a new creature: old things are passed away; behold, all things are become new.” -2 Corinthians 5:17). When we are placed under the water and raised back out of it, we are symbolically stating that we have died to sin, that our old life of sin has been buried, and that we have been raised to new life of grace in Jesus— just as He died for our sins, was buried, and was raised to life again (see Romans 6:3-5 below). 3 … when we were joined with Christ Jesus in baptism, we joined him in his death? 4 For we died and were buried with Christ by baptism. And just as Christ was raised from the dead by the glorious power of the Father, now we also may live new lives. 5 Since we have been united with him in his death, we will also be raised to life as he was. Strictly speaking, the answer is “No.” It is not an act that one does to obtain salvation (“For by grace are you saved through faith; and that not of yourselves: it is the gift of God: Not of works, lest any man should boast.” -Ephesians 2:8 9). A person can be saved who has not been baptized. 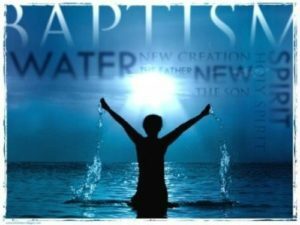 However, the Bible makes it clear that baptism is extremely important and that those who have accepted Jesus Christ as their Savior and who have decided to follow Him, will be baptized. “He who believes and is baptized will be saved” (Mark 16:16, NKJV). “Most assuredly, I say to you, unless one is born of water [baptism of water] and the Spirit (baptism of the Spirit- salvation], he cannot enter the kingdom of God” (John 3:5, NKJV). “Go everywhere preaching the gospel and making disciples and baptizing them in the name of the Father, Son, and Holy Spirit” (Matthew 28:18-20). If we read just these verses in isolation, we might think that it is impossible to be saved without being baptized. However, the Bible is clear that there is no saving virtue or merit in the act of baptism itself. Jesus is our only Savior (see John 3:16; Acts 4:12; 2 Corinthians 3:11; 2 Corinthians 5:17-21). So baptism is not necessary for salvation in the sense that only Jesus can save us. He is our only Savior. And the act of baptism, itself, does not save us. But this does not mean that baptism is not important. It does not mean that we can be baptized or not as we choose— once we have believed on Jesus and accepted Him as our Savior. Jesus said, “If you love Me, keep My commandments” (John 14:15, NKJV). And He has commanded us to be baptized (see Matthew 28:18-20). A person who loves Jesus and accepts Him as his or her Savior, will want to follow Him in baptism.